The Asiatic golden cat is about twice the size of a large house cat. Its head and body are up to 1 m (3.3') long and it weighs about 14 kg (30 lb). Its coat color is variable - it can be golden brown to dark brown, pale cinnamon, bright red, or gray. 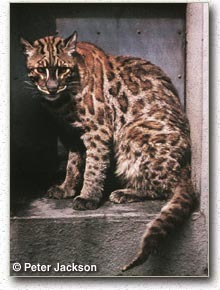 The fur is usually uniform in color, but it can also be marked with spots and stripes. The fur is moderately long, dense, and rather harsh to the touch. The Asiatic golden cat has short, rounded ears, and in all color phases its head is distinctly marked with white lines bordered with black running across each cheek and from the inner corner of each eye up to the crown. The Asiatic golden cat usually inhabits tropical and subtropical evergreen lowland and dry deciduous forest. It has been recorded up to 3,050 m (10,000') in the Himalayas. The Asiatic golden cat does not adapt well to areas settled by humans. It has a wide ranging diet, composed mainly of small mammals (e.g. rats and mice), but also including birds, reptiles and larger mammals such as deer. In some areas the Asiatic golden cat is thought to be nocturnal, while in other areas it appears to be active during the day and at night. 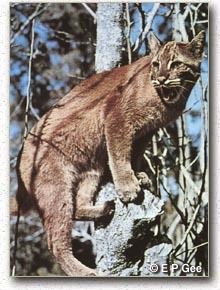 Young golden cats are raised in hollow trees, in rock hollows, and in holes in the ground. The Asiatic golden cat is primarily a terrestrial hunter, but it can climb trees when it needs to. Males and females often hunt in pairs, and the male is thought to play an active role in rearing the young. The Asiatic golden cat is found from Tibet (China), Nepal, and Sikkim (India) through southern China, Myanmar, Thailand, and peninsular Malaysia and Sumatra (Indonesia). Areas of good habitat still exist in Bhutan, parts of northeastern India, and China. It is thought to be uncommon. The Asiatic golden cat is threatened primarily by habitat loss due to deforestation and loss of its prey due to illegal hunting. It is also hunted for its pelt, and its bones are used as a substitute for tiger bone in traditional Asian medicines. 2005: Occurs in Bangladesh, Bhutan, Cambodia, China, India, Indonesia (Sumatra), Laos, Malaysia, Myanmar, Nepal, Thailand, and Vietnam. (IUCN 2005). The Asiatic golden cat’s total effective population size is estimated at below 10,000 mature breeding individuals (IUCN 2005) . The Asiatic golden cat is threatened primarily by habitat loss due to deforestation and loss of its prey due to illegal hunting. It is also hunted for its pelt, and its bones are used as a substitute for tiger bone in traditional Asian medicines (Grassman et al. 2005, IUCN 2005) . Head and body length: 66 - 105 cm (26 - 41") (n = 15+); Weight: 12 - 16 kg (26 - 35 lb) (n = ?) except for 2 adult females that weighed 7.9 and 8.5 kg (17.4 and 18.7 lb) (Sunquist & Sunquist 2002, Grassman 2003). The Asiatic golden cat is found in both the Himalaya, Indo-Burma, Mountains of Southwest China, and Sundaland Biodiversity Hotspots (Cons. Intl. 2005) and the Kayah-Karan/Tenasserim Moist Forests and Peninsular Malaysian Lowland and Montane Forests Global 200 Ecoregions (Olson & Dinerstein 1998, Olson & Dinerstein 1999). The Asiatic golden cat attains sexual maturity by 18 - 24 months (Sunquist & Sunquist 2002) . Thought to be 78 - 80 days (Sunquist & Sunquist 2002) . Litters are born throughout the year in captivity (Sunquist & Sunquist 2002) . 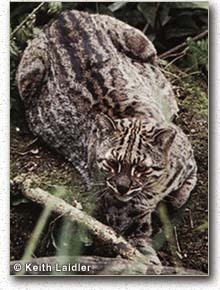 In the wild, a male and female pair was photographed with a small cub in late August in Sumatra, Indonesia (Holden 2001) . 1 - 3 kittens are born (average = 1.11) (captivity) (Nowell & Jackson 1996) . If a litter is lost, the mother may produce another litter within 4 months (Humphrey & Bain 1990) . Up to 20 years (n = 12) (captivity) (Nowell & Jackson 1996) . Activity - Published information on the activity patterns of the Asiatic golden cat displays varying results. A number of authors state that the Asiatic golden cat is primarily nocturnal (Nowell & Jackson 1996, Sunquist & Sunquist 2002, IUCN 2005) . However, a study using photo-trapping in Sumatra, Indonesia (Holden 2001) indicated that the Asiatic golden cat was cathemeral. Forty-seven percent of the photographs showed the golden cats moving during daylight hours, with no particular bias towards crepuscular activity, and 53% of the photographs showed them active during the night. Finally, in a study in Thailand that followed 2 radio-collared Asiatic golden cats (1 female and 1 male) for 12 - 16 months (Grassman et al. 2005) , daily activity levels indicated that the cats exhibited arrhythmic activity dominated by crepuscular and diurnal patterns, with activity peaks occurring between 0801 - 1000 h and 1601 - 1800 h (average activity = 69 %). The greatest numbers of inactive periods were scattered throughout late night (0001 - 0200 h and 0401 - 0600 h, average activity = 40 %) time periods. Overall the two cats were active during 56% of activity readings. Denning - The Asiatic golden cat raises its young in hollow trees, in rock hollows, and in holes in the ground (Humphrey & Bain 1990) . The Asiatic golden cat often hunts in pairs, and the male is said to play an active role in rearing the young (Nowak 1999) .